The new kid on the Residency Road block, Alchemy, dishes out global flavours with a very distinct Indian touch. Plus, the gorgeous rooftop space is perfect for a sundowner or dinner with bae. A party space meets fine dining setting 10 floors above The Chancery Pavilion at Alchemy’s gorgeous rooftop. Minimalist with subtle grey and orange, it really works in the evenings when the whole place gets a golden glow. Bamboo structured wooden roof lends a rustic feel and a bar smack in the centre divides the al fresco space and the fine dining space. The al fresco space is perfect for date nights with the whole of Bangalore’s skyline in the backdrop. 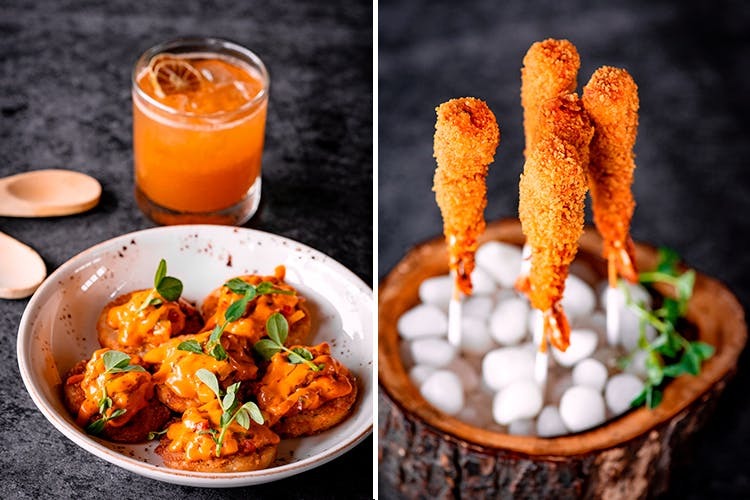 Alchemy’s menu is a fun one with celebrity chef Hari Nayak doing an interesting mix of small plates, mains and desserts. Small plates include Seafood Sausages, Bengaluru Chili Kebabs, Chicken Sukka Bulgogi and Artichoke Aloo Samosa. The bulgogi is a Korean inspired recipe that gets a Kerala makeover with the piquant sukka served in mini appams. The samosas come with a twist; think aloo-wasabi cream stuffing served in a crispy filo cone. Take small bites as the wasabi kick can knock you off the chair! Vegetarians, be sure to order the Tikki Trio that comes with a mushroom galouti, quinoa beet, and kale and spinach tikkis. Wash it down it one of their recommended signature drinks such as the Indian Whisky Sour or Betel Juice. Before you dig into mains, order a portion of the Fire Roasted Corn Chowder Soup, and thank us later. We followed it up with The Konkan Fish Fillet with quinoa chitrana (lemon rice) and lemongrass coconut curry. But we preferred the desi khana with a twist. Sriracha Chicken Naan and Jalapenos & Peas Kulcha which can be eaten as it is or with the rich Kaal Saag that we had. Don’t forget to order the Honeycomb Masala Bread. It shaped like a honeycomb, served in a pan and comes with a masala stuffing. We’re eyeing the Duck Egg Kuttu for next time. End with the unique Gondhoraj Lemon Mousse and a Mysore Pak Cheesecake. Even a choosy dessert person, like this writer’s mother, finished the mousse in record time, a testament to the well made the mousse and lemon creme anglaise. Once the license kicks in, their microbrewery unit will be serving craft beer on tap too.